Congratulations to these well-deserving students and their proud parents! 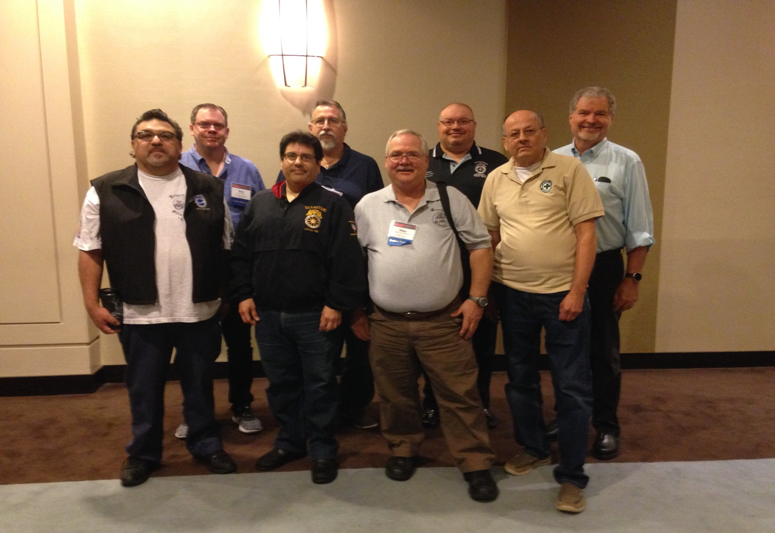 Paul Dodge, Mike Valladares and Ralph Ortiz attended the National Safety Council (NSC) Spring Labor Division from May 20th to 23rd in Rosemount, IL. The Labor Division is comprised of labor unions that meet and discuss safety issues in various industries. The Labor Division is over 200 members strong. The purpose of the Labor Division is to be the conduit for safety-focused information sharing and idea exchange with other Unions and its members and to discuss safety issues with other safety professionals who share the same job responsibilities, have experienced the same challenges and can share their thoughts and ideas to help Unions and its representatives develop solutions. The four days included various committee meetings, education sessions, networking and Union caucuses. On the Transportation committee, chaired by Ralph Ortiz, Safety & Health issues discussed included fall hazard from ladders during engine oil service on wide body aircraft, lack of fall protection due to gaps between power belt loaders and cargo pit, lightning detection systems used at various Airports and the differences found between the system, potential for radiation exposure due to Wi-Fi systems installed on Aircraft, OSHA investigations being conducted at various Air Carriers including a study on the hazards of loading and offloading of motorized wheel chairs and scooters from Aircrafts. At the IBT Caucus, we meet with Teamsters representatives from Local 1150 (Sikorsky) Local 2727 (UPS mechanics) and Local 455 (DEN - UA) to discuss ongoing safety and health issues and challenges each representative is dealing with. The CEO and President of the National Safety Council, Deborah Hersman provided updates on the NSC vision 2020 and spoke on the NSC 3-part report “The Road to Zero” which outlines the plan to eliminate all traffic deaths in the United States by the year 2050. At the conclusion of the four days, the Labor Division Closing Sessions was held which included a report by the Chairman of the Labor Division and reports from each of the Labor Liaisons. The International Brotherhood of Teamsters UAL Benefits Committee has created a Benefits Guide to assist you in understanding your negotiated benefits and to provide you with a quick-reference, user-friendly, document. Benefits have become more complex and are an important part of your total compensation. Employee benefits, negotiated for you by your Union, are part of your total compensation package. These benefits include retirement, medical, dental, long-term disability, sick leave, retiree health account, life insurance, flexible spending accounts, and survivor benefits. It is important for you to have a clear understanding of all the benefits to which you are entitled. A copy of this Benefits Guide can be found on the TeamstersSFO website under the Member Resource tab. The SFO Committee would like to remind you all of the importance of always filling out an absentee Shift Bid Preference Form. These forms should be filled out even if you intend to call in or show up in person for your shift bid appointment. They will only be used if you are not present and do not call in at your assigned appointment time. If you do not fill out the form and are not able to make your appointment for any reason, you run the risk of being assigned a much less desirable shift and work area than your seniority might otherwise entitle you. Once that happens, there is little anyone can do to unwind that reality. Again, please make it a habit to ALWAYS fill out the form so you do not end up on the wrong end of this situation. It is important to always fill out a withdrawal form from your local union If you are going to retire, are transferring to another station, or you are going out on Extended Illness leave. If you ever end up getting another Teamster job after you retire, you can save yourself and the union any confusion regarding initiation fees or back dues if you filled out a withdrawal before you retired. Likewise, if you are transferring to another station, the transition can be much smoother regarding dues if you fill out a withdrawal form. This can save you from having to deal with any mistakes on your check once you start getting paid at the new location. Lastly, we always recommend filling out a withdrawal when you are going on leave for an extended illness. That way, when you come back, there you can be sure there are no mistakes on your paycheck as well. All of these types of mistakes can and will be corrected if they happen, but it is better for all and it definitely saves time and effort if you filled out a withdrawal form in the first place. See your Shop Steward or stop by the Union Office for the form. If you are returning to work from a non-critical illness of short or medium duration that is not related to a protected leave such as FMLA, not due to an Occupational Injury, and not from an Extended Illness Leave, there are a couple of things that you need to know. First and foremost, if you are under a doctor’s care and your doctor is releasing you to come back to work, you must make sure that he or she makes it clear on your note that you are being returned to work at “Full Duty with No Restrictions” if that is the case. After this type of illness leave, once you bring in a doctor’s note indicating that you are released to Full Duty with No Restrictions, if you are prevented from going to work and told that you need clearance from OPCMD, we want you to immediately contact your Chief Steward. If the Company holds you out of service in this circumstance, you must be paid any time from the minute you bring that note to work until the Company clears you to return to work, no matter how long it takes, at straight time on the Company dime. Under no circumstances is it ok for the company to try and make you use your sick time in this situation if they refuse to clear you to work. Period. Additionally, if you are required to fill out an Absence Certificate after returning from a non-critical illness of short to medium duration that does not involve an FMLA related illness, occupational injury or extended illness, we also want you to contact your Chief Steward immediately. More to come. If you find yourself involved in the RAP process for any reason, you must also be sure to know your rights. In accordance with the California Fair Employment and Housing Act (FEHA), it is your right to choose who will advocate on your behalf during the ‘interactive process’. The interactive process is simply the period of dialogue that takes place between you and the Company in order to reach an agreement on accommodation. If you choose to have the Union advocate on your behalf, you must make that choice known to the Company and then make sure to contact one of our Member Assistance Coordinators, so they can help guide you through the process. Remember, it is not a given that the Union participate in the process. You must make that choice. Likewise, you can always choose to advocate on your own behalf or choose to have an attorney represent you. Please contact your Member Assistance Coordinator if you would like more information. Again, you should always know your rights. As many of you already know, once a contract grievance is elevated to the 3rd Step by the Grievance Committee, it is the responsibility of the Business Agents to move it forward. That process will likely initially involve direct engagement with Labor Relations, Human Resources, and Local Management in order to discuss resolution. If no resolution is reached, we will schedule the grievance for a 3rd Step hearing, which is called a System Board of Adjustment (SBA) hearing, per Article 19.D. At the SBA hearing, the Union will present its case supporting the grievance first and then the Company will present its case against the grievance. The System Board consists of four members, two from the Company and two from the Union. There are generally three possible outcomes for a contract grievance. The first is that the grievance is ‘sustained’. In that case, the Company must enact the appropriate remedy. The grievance can also be ‘denied’, which is rather self-explanatory. In both cases, where the Board sustains or denies the grievance, the ruling of the Board is final and binding. The third outcome is called a ‘deadlock’, whereby the Board cannot reach a majority decision. In that case the Business Agents will consult with counsel to determine whether or not the grievance should be appealed to the 4th Step, which is the Board of Arbitration (Article 20). Contract grievances that are appealed to arbitration become the responsibility of the Airline Division and will be arbitrated by the IBT staff attorneys, unless outside counsel is hired. The local Business Agents continue to assist throughout the preparation process for these grievances until they are ultimately heard in Chicago on the agreed upon dates. Arbitration hearings are presided over by a neutral arbitrator, with one member from the Company and one member from the Union also sitting on the Arbitration Board. After presentation of the cases by each sides attorney, in the same order as presented at the SBA, the parties adjourn and await the completion of the stenographer’s report. Once the report is completed and delivered to the parties, the attorney for each side will prepare a final brief outlining all of their arguments. Those briefs are then submitted to the arbitrator to be used in rendering a final decision. Once the arbitrator has rendered a decision, that ruling is final and binding on the parties. Likewise, if any of our members is terminated for any reason, a 3rd Step Grievance is automatically filed on that members behalf. The 3rd Step process for terminations is essentially identical to that which is used for contract cases except the Company presents first. If the System Board deadlocks on a termination, the Business Agents will consult with our local attorney as to whether or not to arbitrate. If the decision is made to arbitrate, our local attorney will handle the arbitration and the hearing will be conducted here at SFO. Now that we have familiarized you with the grievance process once a grievance reaches the 3rd Step, we will be adding this grievance update to the Business Agent Report periodically to give you a breakdown of the of current 3rd Step Grievances and where they are in the process. Because the bulk of the Business Agents’ work is related to 3rd Step Grievances and those at the arbitration stage, we feel that it is very important for all of our members to know as much as possible about the current state of these grievances. We will start with a rundown of the grievance process so far in 2018. A full breakdown of current status of grievances/terminations will follow. There were four termination cases heard at System Board on January 9th and 10th. Of those, the Union was successful in getting two of the individuals returned to work and the Board deadlocked on the other two, which were subsequently appealed to arbitration. Additionally, there were six contract cases scheduled for System Board on January 16th and 17th. Of those, one was settled by the Company prior to SBA (Outsourcing - Plant Maintenance Work) and five were heard. Of those five, one was sustained (Lead Bypass-Supervisor doing Lead Work), one was denied (MM DST EFS Bypass), two deadlocked (GSE Lead Pay & Meal P-post Date of Ratification) and one was remanded back to the parties for settlement (Lead Bypass - this is very rare but does happen on occasion where the Board sees a path to compromise). The two deadlocks were subsequently appealed to arbitration. There were also four System Board hearings scheduled for April 11th. Of those, one was withdrawn (Retirement VAC payout - HRS/RHA credit) after the company provided proof it complied with the CBA, one was settled by the Company (Loss of pay during station transfer badging process) and two were heard at SBA. Both of those cases deadlocked and have been appealed to arbitration (PCL closing VAC/DAT columns & 2017 HRA/RHA pro-rate). There were three hearings scheduled for SBA for July 11th, two terminations and one contract grievance (LX EFS Bypass). One termination hearing has been postponed pending the outcome of current discussions surrounding a resolution. The other two cases will be heard as scheduled. There are eight cases on the radar for the August 14th and 15th scheduled SBA dates. The Union has engaged the Company in discussions to resolve at least two. If there are no termination cases to be heard, the Union plans on hearing six contract cases. More to follow on those after they are heard at SBA because the schedule is still in flux. The following is a breakdown of current grievances. We currently have eight grievances at arbitration stage, four terminations and four contract cases. Of the four terminations, we have one scheduled for a second arbitration day on July 31st, one scheduled for August 23rd, one scheduled for November 14th and one awaiting agreement on an arbitrator/date. Of the four contract cases we have at arbitration, we have one scheduled for September 19th (MealP -post DOR) and one tentatively scheduled for October 17th (GSE Lead Pay). The other two were just recently appealed to arbitration and are still awaiting dates (PCL closing VAC/DAT columns & 2017 HRA/RHA pro-rate). Besides the two terminations at 3rd Step previously discussed, there are a total of nineteen grievances active at 3rd Step, six inactive grievances held in abeyance, and three inactive grievances that are on hold for various reasons. More information to follow as we move forward in the process for each. Well there you have it. We hope you found this informative. June 30th, 1928 - Alabama outlaws the leasing of convicts to mine coal, a practice that had been in place since 1848. In 1898, 73 percent of the state’s total revenue came from this source. 25 percent of all African-American leased convicts died. July 7th, 1998 - A two-day general strike called by a coalition of 60 unions shuts down most of Puerto Rico. More than half a million people participated in the walkout, supporting striking telephone workers and protesting plans to privatize the telephone company. It was the largest work stoppage in the island’s history. August 22nd, 1945 - Flight attendants working for United Airlines form the Air Line Stewardesses Association, the first labor union representing flight attendants. They were reacting to an industry in which women were forced to retire at the age of 32, remain single, and adhere to strict weight, height, and appearance requirements. The union later became the Association of Flight Attendants, and since 2004 has been part of the Communications Workers of America. The communication process is an extremely important part of what we do to represent our folks here at SFO and, as we have been outlining for quite some time, we have been blasting out the BA Report along with any other communication we get from the Airline Division or the International to anyone who registers at the TeamstersSFO website. We feel that it is essential for all of our members to be engaged and informed at all times. Therefore, we encourage all of you to spread the word to your fellow technicians to go to the site and click on the ‘email signup’ tab to get on the list.